A wedge resection is a type of surgery used primarily to either diagnose a disease or treat cancers that have spread to the lung. 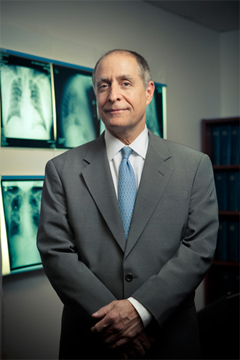 This surgery is performed to remove small sections of diseased lung. Why is a wedge resection performed? A wedge resection is done to remove a small portion of diseased lung, a small tumor, or a portion of lung cancer. The surgery is done if the disease has been caught early, and a part is removed to prevent further spreading of the cancer or disease. There are several methods used to remove small portions of lung. “VATS” stands for video-assisted thoracoscopic surgery. In a VATS procedure, a lobectomy is performed through a few small incisions using special instruments and a camera. During the procedure the surgeon will use the camera attached to a thoracoscope to visualize the inside of the chest through a monitor. Using specialized tools, the surgeon and his team are able to operate inside the chest through several small cuts, or ports. VATS lobectomy is a minimally invasive procedure and involves removing a portion of the lung. This is usually the first surgical technique to be considered for a lung wedge resection, however other traditional procedures will also be considered after evaluation of your lung condition. In an open lung resection, a thoracotomy is performed to allow the surgeon to have open access to the chest (thoracic) cavity. The cut (or incision) is about 10-15cm that extends the patient’s side from over the ribs, under the arm, and up the back.